Pregnancy can be overwhelming at the best of times, and like anything in life, preparation is crucial. When it comes to an unplanned pregnancy you may find it difficult to decide on what to do. If you decide to continue with the pregnancy you need to start your antenatal care. This is a great time to build a support system of friends and family who will be there for you through your pregnancy and after your baby arrives. It is crucial that you discuss issues that bother you, however trivial they may seem. 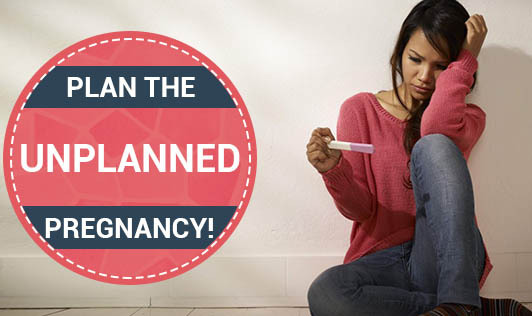 The following tips will help you to deal with an unplanned pregnancy. 1. Get Educated - Since you weren't planning on getting pregnant, it's likely that you haven't spent enough time learning about pregnancy and what to expect. Take time to consider what changes you can make for a mum-to-be while still aiming for other life goals. 2. Stay positive - Have a positive outlook regardless of the situation. Release your emotions to help you cope with the unplanned pregnancy. This will keep down your stress levels, benefiting your baby and people around you. 3. Getting support -Try to get support from family and friends to make yourself physically and emotionally strong that can help you make wise decisions. 4. Give a healthy start to your life - It is high time that everything you do has an impact on your baby's health. it's the right time to begin with healthy eating and getting adequate exercise to stay fit and healthy throughout pregnancy. Cut back on partying, alcohol, drugs and smokes for a successful pregnancy. Discuss with your physician on the intake of folic acid and multi vitamin supplements. 5. Start Saving - Having a child is an expensive adventure, so you will want to start saving some money to lessen the blow of all the unforeseen costs you'll soon be encountering. Think, spend time imagining how wonderful your life will be when your new born arrives.